A very productive and moving day. 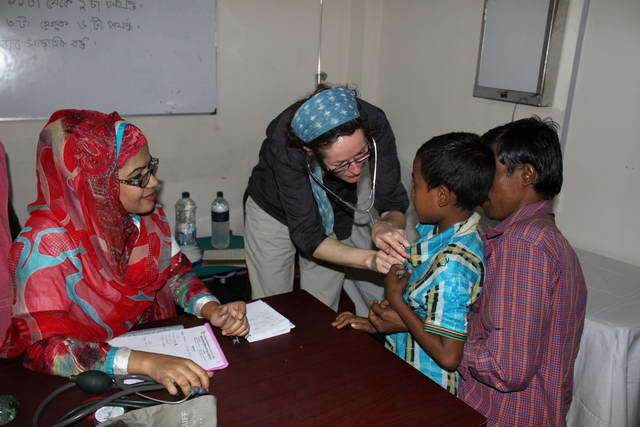 We spent time in the clinic seeing patients with Dr Misty, and also had a tour of the slum by the woman who is in charge it would seem of all that happens in the slum. We were welcomed in to the home of one of the slum community leaders, (a bamboo shack on stilts – but double decker) , and he gave a very long speech, via translator, thanking us for our support, in enabling the clinic to be built. There is so much to say that it is impossible in one post, but the thing that has struck me most over the last 2 days, is that most of the mums are very young, and most of them that we have asked have lost 1 or 2 babies in the neonatal period. Dr Misty explained that most births in the slum are attended by a Dae, which is a woman from the community, who is not trained. If something goes wrong, many cannot afford to go to hospital…. Dhaka is noisy, the blast of car horns constant. Charlotte has also commented that it is dusty, everywhere is dusty; even all the leaves on plants and trees are brown with dust. We started the day at a meeting in the main ARBAN Bangladesh office. This was so that we could meet all the different project co-ordinators and get a sense of what work they do and how it interconnects. After that it was time for our first trip to the slum. We walked in down the slope that has become so familiar to me through the photo we show in the presentation – although Atique the project co-ordinator was keen to show me that it had changed as the main road along the middle of the slum has now been paved. We were naturally stared at and followed by children. This made it difficult to walk up the narrow steps that ARBAN UK has funded as they lead to the new clinic. I felt quite emotional approaching the clinic, knowing all the hard work and generous contributions that had made it possible. We were surrounded by a crush of people, given more flowers and introduced to Dr Misty. Jo and I cut a ceremonial pink ribbon and that afternoon’s clinic was opened. We were all very impressed with how organised the set up is. Slum dwellers pay 10 taka (10p) for a consultation. When they have paid a slip is written out for them and their name is recorded in the ledger. Shireen, one of the two teenage girls who work in the clinic, takes the slip and Raschid, the caretaker, stands on the door and keeps charge of the crowd, calling people when it is their turn. Three people wait inside the clinic and in turn see Dr Misty who sits behind a desk. There are weighing scales and an examination couch and equipment to test blood sugar, which we saw being done today. The patient takes the prescription to the pharmacy desk where Sweety, another teenage helper, gives out the drugs and the person signs in the ledger. Many people were just doing a thumb print as they cannot write. Dr Misty did 28 consultations today. We slowed things up as we were asking lots of questions. Jo was involved in the examinations, listening to chests and heartbeats with her stethoscope. Dr Misty was excellent at giving practical advice as well as prescriptions. But simple advice becomes complicated when you have no money. Dr Misty told one mum with a sick baby to make sure she boiled the water, but the mum said she could not afford the fuel to do that. 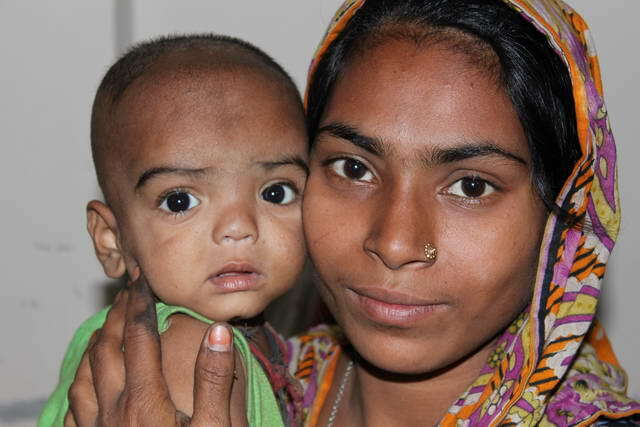 ARBAN UK is able to help alleviate some of this “poverty sickness” some ways – we give nutritional support where Dr Misty thinks it is needed and today the baby pictured below was put on the programme. He is one year old, his mum is 18. This baby is a twin and the mum also has an older child aged 7, making her 11 when she first became a mum. She works in a shop and takes the babies with her but she is aware she is not able to care for them in the best way they need. The clinic has a fantastic way of providing nutritional support. So that they ensure the people who really need it are getting the food, it’s not being taken by others or the money used for other things, the people on the programme come to the clinic twice a day where they are given bananas and other seasonal fruits and boiled eggs, simple foods that they can’t afford. This was another example of how well set up the clinic is to offer the best support it can with the resources available. We are back in the clinic tomorrow morning and also meeting the women from the Health Centre Management Committee who oversee the running of the clinic. 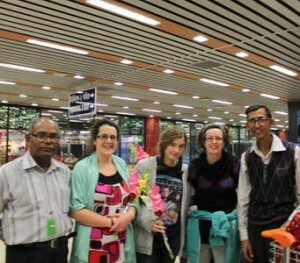 We walked into Dhaka airport to the sound of the call to prayer. The halls were marble and bare, no bustling shops as in Dubai where we had changed planes. In Dhaka there was a particular smell; confusion about who was in which queue at immigration and a crush of bodies trying to collect their bags. Very few westerners, mostly Bangladeshi men. Dr Kamal, head of ARBAN Bangladesh was very excited to see us. He and Atique, the project co-ordinator for our clinic, greeted us with smiles and waves and a tall bunch of pink and yellow flowers each. We stepped out into the warm afternoon air and into the Dhaka traffic. Buses with scrapes all down the side shove themselves in front of you and tuk-tuks find an extra lane along the verge. It is now just over a week until we fly to Dhaka*. Myself, Jo and Charlotte are all excited but also anxious about what we will encounter and how we will cope. While we are away I will be keeping a blog about what we see and how we feel, to really try and give a sense of what it is like to live in Jheelpur slum. Jo is a paediatric nurse and is looking forward to working with the doctors in the clinic to find out what sort of cases they see. I am keen to discuss how the clinic is run and what we need to maintain it each month, so that ARBAN UK can plan for the future and structure fundraising activities accordingly. Charlotte is 16, on her first trip to the developing world. She wants to train to be a doctor and so is keen to gain experience of our clinic to help her understanding. 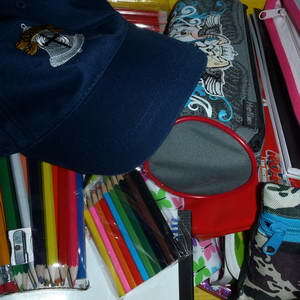 We are also taking gifts. Pupils and families from Olveston School have generously donated 114 pencil cases with pencils, felt tip pens, rubbers and rulers, for the children of Jheelpur Slum. I am looking forward to sharing these with the children. It has occurred to me that some of these children may never have held a pen or pencil before, so this gift is going to offer a very valuable experience to them. There is so much we take for granted living in the UK. 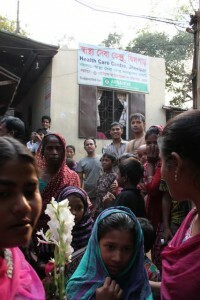 I hope that through this blog I can share with you some of the life-changing moments we have in Jheelpur Slum. * Please note that this trip is self-funded. 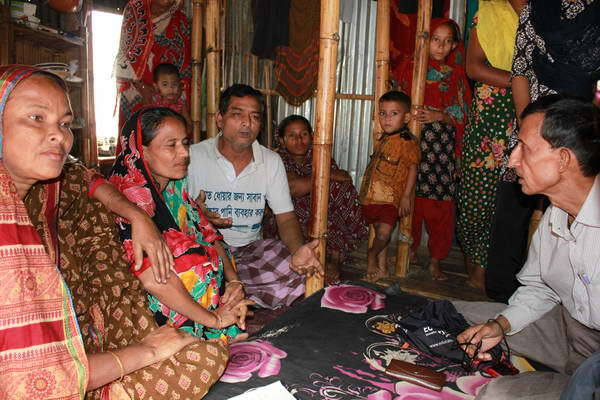 All money raised by ARBAN UK is spent in the slum.